Everyone’s saying it, but I really can’t believe it’s March already! I’m barely getting my head around the fact that it’s 2015! 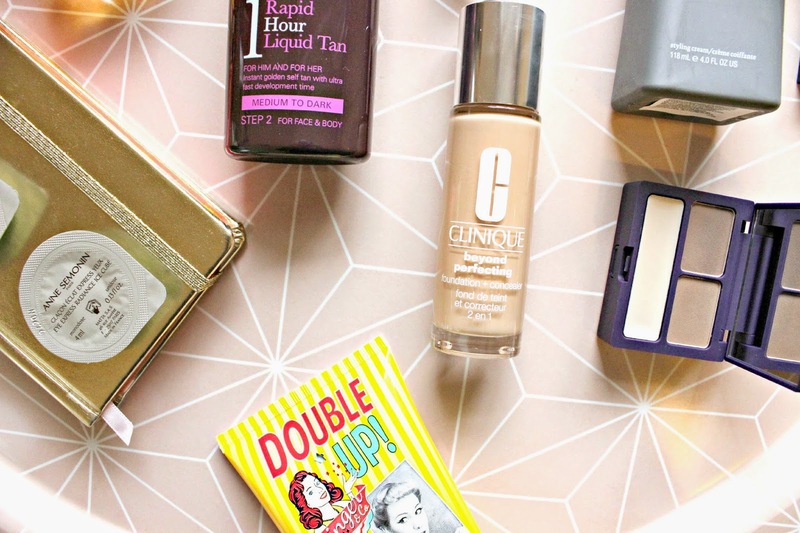 This month I had another trip to the U.S so there’s a couple of products here from Sephora, as well as some old favourites which I’ve been loving using again. Some new launches too which have seen lots of hype, but so worth it in my opinion! 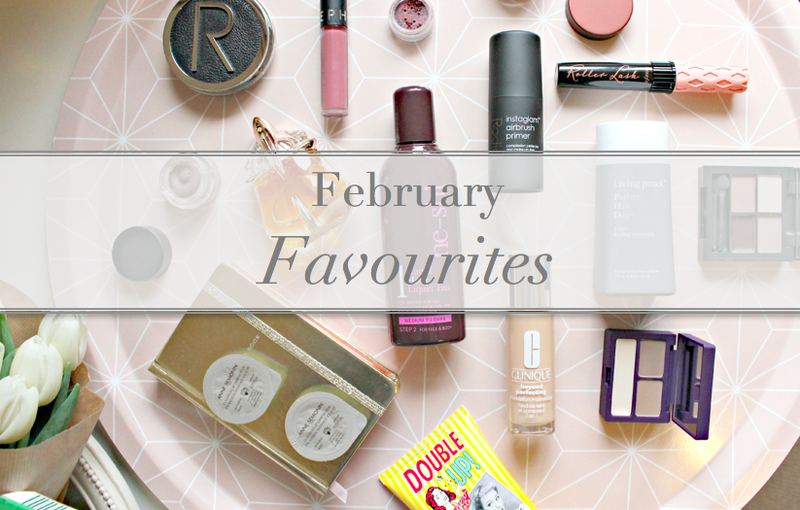 Anyway, enough chit chat, here are my monthly favourites! 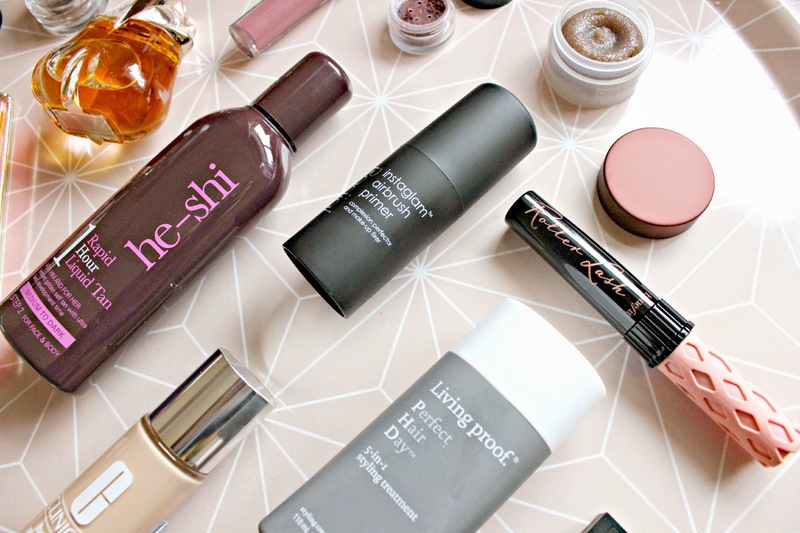 The first product in my favourites is somewhat ground-breaking for me! I suffer from major eye bags and shadows, and this month I’ve been discovered the Anne Semonin Eye Express Radiance Ice Cubes. These cute little pots go in your freezer, then you pop them out in the morning (just one), wrap it in the provided gauze, and smooth over the eye area. Not only does the icy sensation make the whole area feel tingly and more awake, but the active serum works to de-puff and reduce shadows. 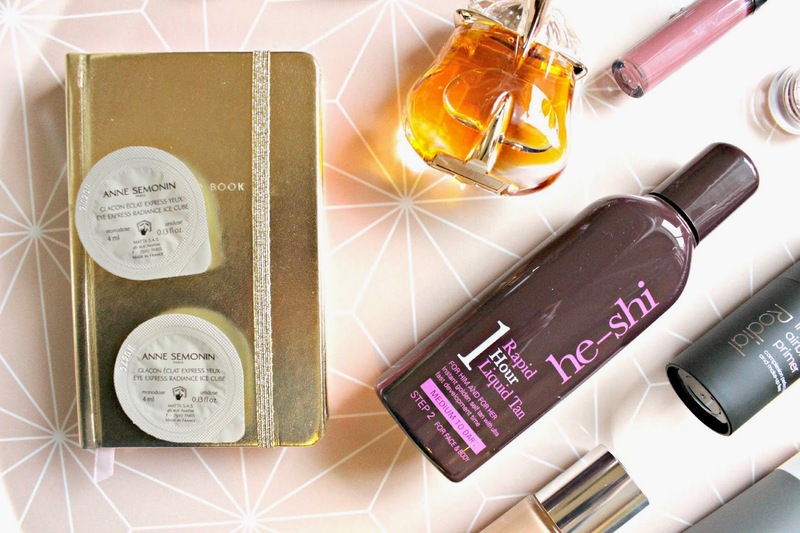 Whenever I’m in need of a quick, intense tan fix, I reach for the He-Shi Rapid 1 Hour Liquid Tan. It develops in 60 minutes and it’s the darkest instant tan I’ve ever tried. Beware because the solution is very liquidy and very dark, so don’t do it over any carpets! This month my skin was almost grey in colour after Fashion Week, so in order to not look like a zombie I reached for this tan to banish the paleness! This month I’ve been spritzing Thierry Mugler Alien Essence every morning. I love the original fragrance but this new variation is a little more grown up, with notes of amber and vanilla. It is warming and not quite so sweet as the classic fragrance, and I love that it lasts all day with no need to top up. A new launch this month which I was incredibly excited to try was the Clinique beyond perfecting Foundation and Concealer. With a ‘magic’ wand applicator and promises of full and flawless coverage with a lightweight formula, this foundation had a lot to live up to, and I was somewhat sceptical to believe all the claims. The details also talk of smart technology which tailors to your skin, adding hydration to any dryness and absorbing excess oil if it needs to. Well, my skin this month definitely put the Clinique foundation through its paces (two long haul flights, minus 24 degree winds and full days with no topping up of the makeup) and I have to say, it won me over! While it doesn’t absorb oil enough for me to totally skip the powder, the coverage lasted all day with no need for me to touch up, and my dry skin from the flight was soothed by the breathable formula. My NARS has been pushed to the back of my makeup drawer (sorry, I really do love you though!) in favour of using the Clinique as my everyday foundation. Appearing on my radar this month is a new brand called Ginger & Co, and the retro, colourful packaging reminds me a little of Soap & Glory, but with even lower price points! Their Double Up Shower and Body lotion is a fab multi tasking product as you get a great cleanse, and it also moisturises skin so you can skip the body lotion after showering, on those mornings when you’re in a rush (or just a bit chilly!) the smell of Ginger root & Juniper berry is very fresh and awakening – it’s a lovely addition to my morning routine and you can pop it in your basket (for under £4!) next time you do an Ocado shop online. After watching one of Vivianna’s U.S haul videos, I decided to pick up the Living Proof Perfect Hair Day from Sephora while I was in New York. It took a while for me to figure out the best way to use this, at first I wasn’t impressed. I’ve found that this does make a big difference to my hair as long as my hair isn’t too dry. If I use a decent conditioner, and then apply the styling treatment, then my hair will be shinier, softer, and generally better than if I don’t. My hair doesn’t feel like it’s got any product in, yet it provides heat and UV protection as well as static control! I just love all the cute boxes for Urban Decay products, and the Brow Box is just such a wonderful dinky kit for all your brow needs! Complete with colour and wax as well as tweezers and brushes, it really is everything you need in a cute little tub. Unlike so many kits, which have contain cheap versions of the brow accessories, the Urban Decay tweezers and angled brushes are actually really high quality to you can build the perfect brow shape, then find your exact shade using the brow powders. The silky powders, as you’d expect from Urban Decay are ultra fine and perfect for achieving natural looking brows. Sleek do the best budget sets, and their new i-Quad is another winner. With four shadows which easily blend, and a creamy gel liner, you can create a smoky eye or a natural look depending on how you build the shades. The colours are highly pigmented, and the kind of shades which suit most skin tones – plus, at just £5.99 you can afford to buy a few of the different shade options! I’m not the biggest fan of the brushes that come in the palette, but with a good blending brush you can create a lovely soft brown smoky eye using the kit. 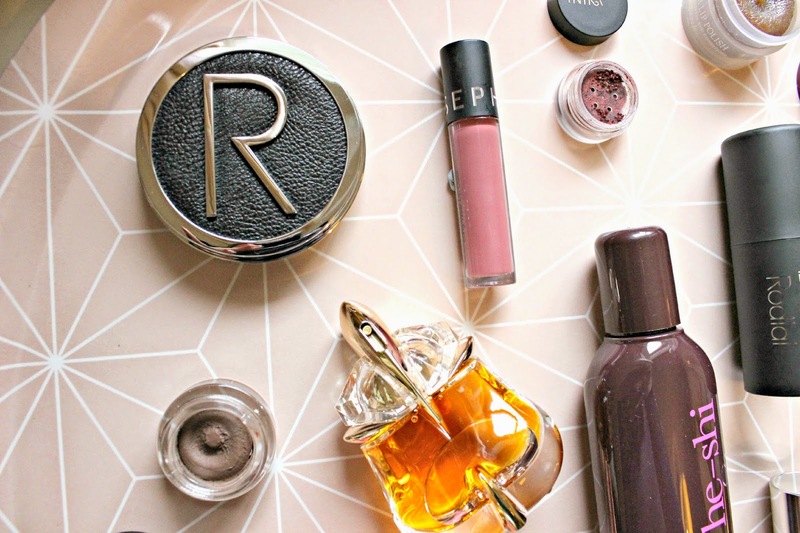 I was drawn in by the name of this primer, and the Rodial Instaglam Airbrush Primer is now a firm favourite as part of my daily routine. With a super soft texture which creates the ideal base for applying makeup, the airbrush primer seems to really agree with my combination skin. Never before have I had so many compliments on my skin, and even when I wear a budget foundation, my makeup lasts all day, and looks glowy without being shiny. The Fresh Sugar Lip Polish was a bit of an impulse buy, and very excessive considering that I never really used to use my Lip Scrub from Lush, but I’ve really enjoyed using it to slough away the rough skin on my lips, and I weirdly really love the taste! The brown sugar works wonders at buffing away dry flakes, and leaving a smooth, conditioned feel to lips. Of course it wouldn’t be like Benefit to launch a mascara quietly! But the Benefit Roller Lash mascara really is worth shouting about. I originally tried it out via the mini which came with my Elle subscription, but I loved it so much that I just had to get my hands on a full size version. The brush combs through lashes giving you a real bambi eyed look, and the glossy formula lifts and curls lashes without clumping. I find I don’t need to use eyelash curlers with this mascara, but when I do my lashes look almost cartoon like! You can try it out and pick it up in Benefit’s Pop Up Curls Best Friend Parlour, find out what it’s all about in my post about it here. 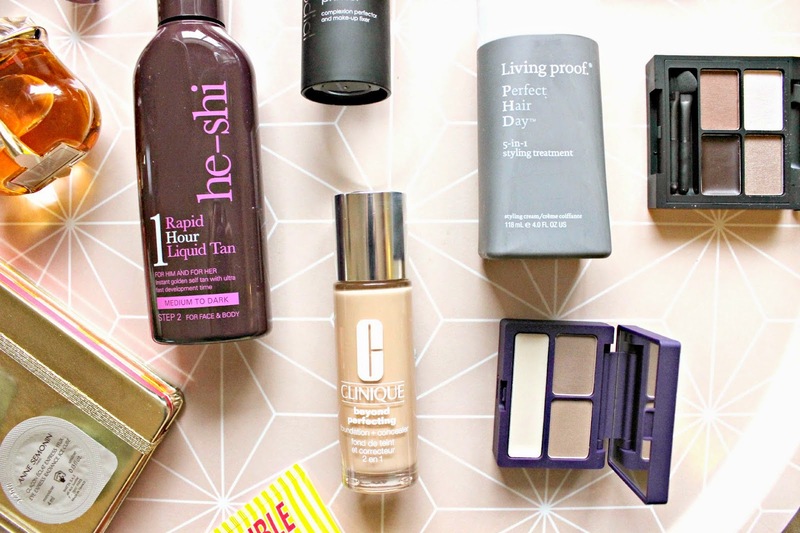 During these chilly months, most of my bronzers are too, well, bronze. In search of a far more natural glow rather than a tanned look, I’ve been reaching for my Rodial Instaglam Compact Deluxe Bronzing Powder. It gives a light sun-kissed colour, and a lovely glow, and I feel comfortable swirling it all over my face to add some colour to my otherwise rather grey complexion! I wasn’t sure what to do with the Rodial Eye Sculpt Cream until I had a Rodial Sculpting Masterclass at the Fashion Monitor #beautylounge during fashion week. I was so blown away by the ease of application, and the versatility of the formula, that I couldn’t wait to try it myself when I got home. The mousse like formula can be used to sculpt the lid, built to create a defined smoky eye, or even used to fill in brows. The Sephora Cream Lip Stain is another blogger – inspired purchase, in fact I think one of my lovely twitter followers recommended that I picked one up from Sephora! I chose the shade Marvellous Mauve, as I’ve been loving these muted pink shades recently, and the lasting power really is brilliant and it doesn’t dry out my lips at all. It’s not quite as long lasting as the Rimmel Provocalips, but it’s also easier to remove! For the few evenings out that I’ve been out this month, I have been using a new Inika Mineral Eyeshadow in this fabulous jewel purpley maroon shade which looks so lovely with green eyes. The formula can be used wet or dry depending on the intensity that you are trying to achieve, and has super lasting power. Do you ever look in the mirror at the end of an evening, and think it such a waste to take off your makeup? That’s how I feel every time I use the Mineral Eyeshadow because it still looks so darn good at the end of the evening! I’d love to know if you’ve tried out any of these products, and if you have, do you love them as much as I do?